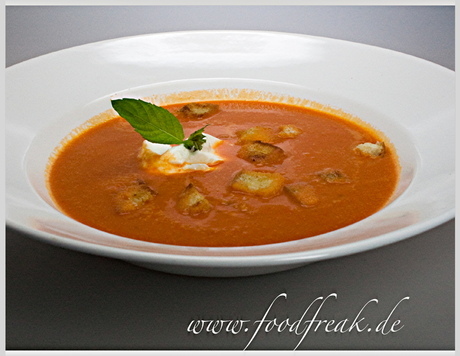 The minute I spotted two lovely red bell peppers in my weekly organic veggie delivery, I knew I had to make a cream of bell pepper soup – just perfect for an entry in the Souper Sunday weekly foodblogging event, the brainchild of Kahakai Kitchen. (I just had finished cooking a huge pot of chicken stock, so this was a no-brainer, really). (By substituting vegetable broth for the chicken stock, you could of course turn this into a lovely vegetarian first course). You can use any flatbread or white bread for the croutons, I just happened to have almost stale ciabatta at hand. Quarter and seed the bell peppers, chop coarsely. Peel the potatoes, and chop them coarsely, too. Slice the (peeled) garlic. Halve seed and slice the chile pepper. Melt about a tablespoon or two of butter in a soup pot. Sauté peppers, chile pepper, potatoes and garlic for a few minutes, then stir in the tomato paste, and deglaze the pan with white wine. Add the broth or stock, season with salt (of the stock isn’t salty) and pepper, and bring to a boil. Let simmer for 25 minutes. You may need to check if the potatoes are done (because of the acidity of the white wine). If needed, simmer a few minutes more. Cube the ciabatta and roast in butter and olive oil in a nonstick skillet. Meanwhile, puree the soup (if using a blender, do it in batches – I use an immersion blender right in the pot). Taste for salt & pepper, and maybe correct the acidity with a drop of white vingear, if needed (usually it doesn’t). ladle into bowl or soup plates. Distribute croutons among the servings. For each serving, add a dollop of sour cream, decorate with a basil leave, and serve. This is, in fact, slightly hot – not as hot as in chili, but with a distinct tingle on the tongue, so make sure you adjust the hotness to taste by adapting the type and amount of hot chile pepper used.